You have to give some credit to Huawei consumer CEO Richard Yu, he definitely knows how to build a headline, doesn't he? Today at CES, Yu said, "Steve Jobs is gone. Now there is a lack of innovation." But, Yu wasn't done with just dropping Steve Jobs' name to get some attention. He also went on to call out Samsung for not using high end materials, saying "their plastic is cheap". Of course, he was also very ready to explain why you should look to Huawei to find a new wellspring of innovation, using his attention catching phrase to lead into the usual marketing talk about Huawei's new Ascend Mate and Ascend D2. Yu started out by saying that Huawei is the best company as far as design because of two reasons: 1) it mixes Asian and European design, and 2) it has spirit. "We're a globalized company, so that's why we can do better. And behind all that, we have our spirit. It's very important." But, Yu did admit that it will take time for US carriers to accept high-end devices from Huawei, because the company does have a reputation for making lower-end devices. He does think the newly announced devices will be a big part of that, even if some people are scared of the size of the 6.1" display on the Ascend Mate. Being the good company man, Yu said that the device was "more comfortable than the Galaxy Note" because of the design, and the one-handed mode available for the keyboard. What do you guys think? Will Huawei be able to break into the high-end smartphone market? Sorry but Huawei is far from being the best in design, i would give that title to either Nokia, HTC, Sony and maybe Apple (i know it still looks the same but it looks good). Not to mention some of Huawei's phones look awfully a lot like other phones. Huawei is just as useless as apple. 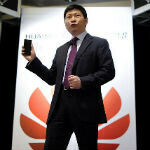 I want the Huawei Ascend Mate to sell well competition is always great. They have NO SOLID STANDING with android and nobody buys Huawei anyway. Everyone know's Samsung is the real deal in this space. So is LG... but i trust they could be the next big thing. ROFL@the title of the article. Using the name of the dead forhis own selfish interest? How disrespectful! Amen brotha! I wish the US could see some of those devices they recently announced! What did they even innovate, just modified it. Their idiocy pretty much means I will never own a Huawei product. Huawei continues to demonstrate three key things: 1) they have no class, 2) they have no concept of a proper media relations strategy, 3) they harbor the belief that operating in multiple countries with total Chinese operational control means that you are a savvy multinational company (they aren't, note items 1 & 2). Sidebar note: Huawei devices and quality control have never met each other. this. everytime i read something about a huawei device on forums, it's always about the power/volume buttons creaky/falling off, the mic stopped working for no reason, etc. TheGrendel: So true. Actually, I almost spit the water I was drinking when I read the headline. Even more so when he took a cheap jab at Samsung using plastic materials on high end devices. To me, both sounded a little too amateurish of an approach coming from a consumer CEO. See how even Chinese company's know it as well. We've been saying that since the 4S came out and that is the whole truth. Talk is cheap, but you do have to admit their new phones do look competitive. Probably the first time you could say that about a Huawei device, but its still true. I prefer plastic phone for their light weight to me been the lightest to carry around is more important. Plus most people i know change their handset every 12 months so having the best possible spec with long battery life is more important. Samsung deliver in that aspect so their sale is better than most android manufacturer. i really like Samsung light weight build, so i don get some people fuss on plastic. At the end of the day, its still personal preference. Did he mean a lack of theft because that's all that was going on was Steve Jobs innovation THEFT LMAO. Hey he got the iPhone going in 2007, ever since then there has been NO innovation . I wouldn't call making the phone flat and .5" bigger innovation. This guy is a hypocrite. Plus, I don't need any more sh*t with an amatuer spy radio on-board. Huawei is going to get nowhere dissing big companies like Apple and Samsung before they even sell their first high end smartphone in the US market. Their design is nowhere near the best. I was thinking about their Ascend D2, but now Sony took the spotlight. Huawei is not going anywhere for now. Try to show more class next time. I am a Samsung Note buyer but I will readily say that Apple puts innovative spin to existing technology and combines aesthetical concepts to produce products that a whole lot of people like . That much is easy to see . But Android is easier to use and Note2 is a glorious phpne . Do wish Sammy wd produce a metalic phone that looks beautiful and that trounce Apple for good . Good to know Huawei didn't lack humor, granted if it was funny to begin with. I say big talker small walker. its not point in blowing your chops if you cannot convince the global network of carriers to join up with you. They have yet to prove their support and ability to get behind a product for long periods of time and are not simply replaced quickly due to cheaper manufacturing. I want to see what they got but they better bring it.